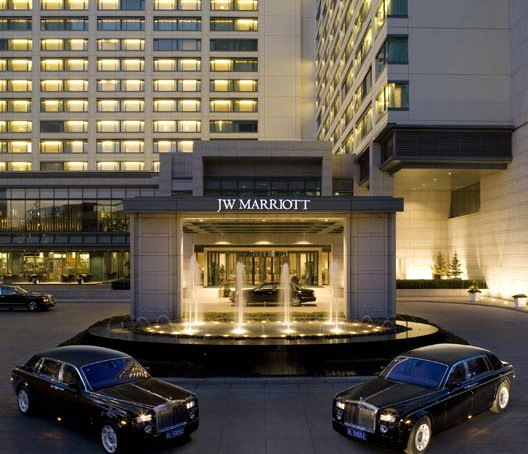 Whether visiting China for business or leisure, you'll find the most luxurious accommodations at the JW Marriott Hotel Beijing. Located in the central business district, our 5-star hotel in Beijing is part of the China Central Place, an awe-inspiring complex featuring offices, shopping and residential towers. At our spectacular hotel, enjoy first-class services, spacious accommodations and incredible amenities. Rooms and suites offer luxurious bedding, 42" flat-screen TV, high-speed Internet, laptop-size safe, mini-bar and rainforest shower. Three exquisite restaurants and two lounges are perfect for dining and catching up with family and colleagues. After a busy day, relax in our indoor swimming pool and steam room, pamper yourself at Spa and visit our 24-hour gym for an invigorating workout. When planning a conference or social event, you couldn't choose a finer hotel. The Marriott hotel in Beijing features 1,800 square metres of space, event planning and catering to make your event unforgettable.